Degeneration of dopaminergic (DA) neurons in the substantia nigra pars compacta (SNpc) is a hallmark of Parkinson’s disease (PD). While the molecular mechanisms that guide the selective loss of these cells are not fully understood, several factors, including mitochondrial dysfunction, oxidative stress, and diminished neurotrophic signaling, have been implicated. Durga Meka and colleagues at the University Medical Center Hamburg-Eppendorf evaluated DA neuron survival and mitochondrial integrity following loss of parkin and/or the receptor for glial cell line-derived neurotrophic factor (GDNF) RET, both of which have been independently implicated in PD. Mice lacking parkin alone showed no age-dependent loss of DA neurons; however, deletion of parkin in combination with Ret exacerbated the progressive degeneration of SNpc DA neurons observed in RET-deficient animals. Conversely, overexpression of parkin rescued the neurodegenerative phenotype in RET-deficient mice. In a neuronal cell line, knock down of either parkin or RET resulted in mitochondrial fragmentation, which could be rescued by restoration of GDNF signaling or parkin, respectively. Moreover, PI3K-dependent activation of NF-κB was critical for the restoration of mitochondrial integrity. Collectively, these findings identify a synergistic role for RET and parkin in SNpc DA neuron survival and mitochondrial integrity. The accompanying image shows DA neurons (stained with anti-tyrosine hydroxylase, brown) in the SNpc (outlined in red) and ventral tegmental area (outlined in blue) of 24-month old control (upper left), parkin KO (upper right), RET KO (lower left), and RET/parkin double-KO (lower right) mice. Citation Information: J Clin Invest. 2015;125(5):1873-1885. https://doi.org/10.1172/JCI79300. Parkin and the glial cell line–derived neurotrophic factor (GDNF) receptor RET have both been independently linked to the dopaminergic neuron degeneration that underlies Parkinson’s disease (PD). In the present study, we demonstrate that there is genetic crosstalk between parkin and the receptor tyrosine kinase RET in two different mouse models of PD. Mice lacking both parkin and RET exhibited accelerated dopaminergic cell and axonal loss compared with parkin-deficient animals, which showed none, and RET-deficient mice, in which we found moderate degeneration. 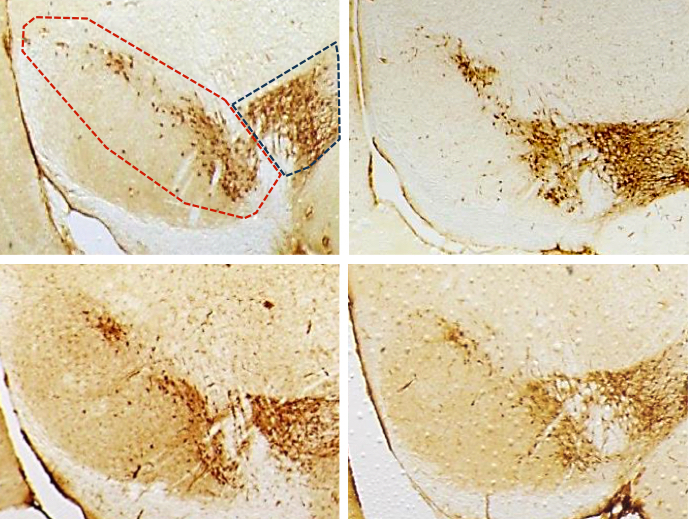 Transgenic expression of parkin protected the dopaminergic systems of aged RET-deficient mice. Downregulation of either parkin or RET in neuronal cells impaired mitochondrial function and morphology. Parkin expression restored mitochondrial function in GDNF/RET-deficient cells, while GDNF stimulation rescued mitochondrial defects in parkin-deficient cells. In both cases, improved mitochondrial function was the result of activation of the prosurvival NF-κB pathway, which was mediated by RET through the phosphoinositide-3-kinase (PI3K) pathway. Taken together, these observations indicate that parkin and the RET signaling cascade converge to control mitochondrial integrity and thereby properly maintain substantia nigra pars compacta dopaminergic neurons and their innervation in the striatum. The demonstration of crosstalk between parkin and RET highlights the interplay in the protein network that is altered in PD and suggests potential therapeutic targets and strategies to treat PD.